Trusting the recommendations of friends and family, Tom and Christina Oakley met for drinks at Gecko’s Bar & Grille one night in August 2013. That evening went so well the couple decided to rendezvous again just a week later at Mothers Restaurant for dinner. Fast forward a few years: Tom popped the question while in Disney World in June, 2017. The Oakley’s have enjoyed almost five years of traveling, kayaking and skiing together. Christina enjoys preparing meals for the pair, while Tom dabbles in woodworking and home improvement. The two live in South Buffalo. 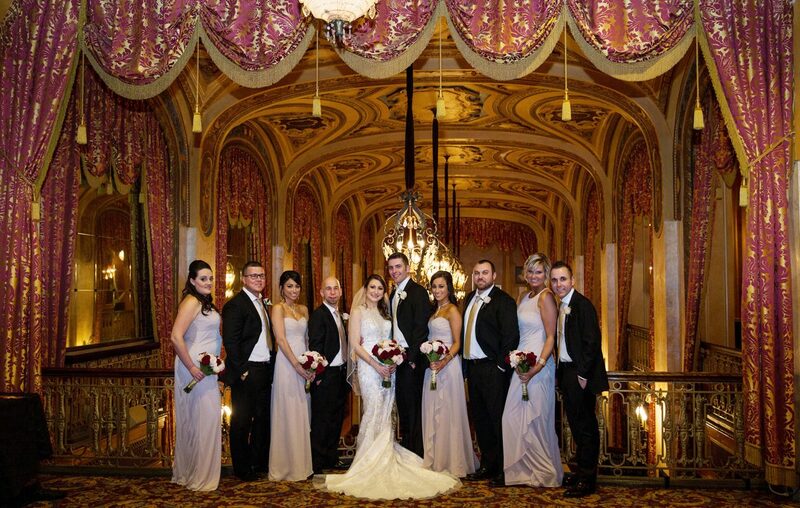 Christina, 31, a medical credentialer, and Tom, 32, an engineer, tied the knot at St. Michael Church in Buffalo on January 13, 2018 — then celebrated their nuptials with a reception at Shea’s Performing Arts Center with almost 200 guests. The Oakley’s memorable evening was catered by Rich’s Catering & Special Events with filet of sirloin & Frenched chicken breast served with garlic confit potato puree, roasted vegetable tart and bordelaise sauce as the entree. Dessert included coffee with flavored syrups and whipped topping along with brownies, cream puffs, assorted and Italian cookies and half white, half chocolate cake by Cookie Patisserie & Bakery. Tom and Christina shared an evening of love, laughter and timeless memories on the stage of the theater as they danced together for the first time as husband and wife. Dressed in Allure Couture from M.A. Carr in Orchard Park paired with blue Manolo Blahnik stilettos, Christina was a stunning bride as she, and her husband, Tom, shared their first dance to Night Train by Jason Aldean. “We would like to thank our family and friends for their support and for being there to share our special day with us. Shea’s, as well as all of our vendors, did an amazing job and we would like to thank them for making our wedding perfect,” said Christina.